Invasive aquatic species are one of the four greatest threats to the world’s oceans, and can cause extremely severe environmental, economic and public health impacts. The GEF-UNDP-IMO GloBallast Partnerships Programme is assisting developing countries to reduce the transfer of harmful aquatic organisms and pathogens in ships’ ballast water and implement the IMO Ballast Water Management (BWM) Convention. The GloBallast Project is an outstanding example of direct, large-scale action taken by IMO together with other international entities, to address a global threat to the health of the world’s oceans, by further improving the environmental and socio-economic sustainability of shipping and reducing its negative impact on the marine ecosystems. 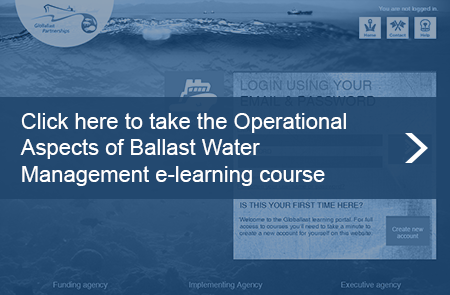 The GEF-UNDP-IMO GloBallast Partnerships Programme in collaboration with the Global Industry Alliance (GIA) created a dynamic elearning platform on Operational aspects of Ballast Water Management accessible through the learning portal on this website, and available to the shipping community for free. Please click on the image to start a unique learning experience. IMO-BBC Invaders from the Sea documentary.